Has there ever been a more spectacular way of silencing the haters? Has there ever been a more emphatic way of banishing demons which one club has not been able to escape for five years since Steven Gerrard's slip? Mohamed Salah's goal was not necessarily the most important for Liverpool because it was not the first of the game, but it was the one which will involve the most replays - perhaps until the end of time if a league title comes to Anfield next month. Salah had performed with the sort of intensity and trickery that had been absent from the rest of his team's play before they took the lead and there was a developing sense that he might do something - but surely not as outrageous as this. Robbie Fowler believes the purest strike of his Liverpool career was the one against Aston Villa 23 years ago when he turned Steve Staunton before ramming a low-rising shot past Mark Bosnich from 30 yards. Salah's did not involve the skill of Fowler's or the distance, but it was more dramatic and it was pumped towards the top corner rather than the bottom. The scenes inside Anfield in the seconds after that moment were of atomic intensity due to the scale of the pressure which had previously been present. Two second-half minutes washed all of that pressure away. The mood shifted primarily because of another sideways pass by Jordan Henderson. The midfielder, who has often been criticised for making too many of them, had been close to Chelsea's defensive touchline when he made this one, though. Liverpool's crosses from that position before had been blind, but Henderson's was perfectly directed. Two yards out, Sadio Mane could not miss with a header. This game, however, will be remembered by what Salah did 90 seconds later. His substitution as injury-time approached felt like a gesture by Jurgen Klopp (above) to allow Anfield to acknowledge his brilliance. What followed was a presidential reception for the forward that Anfield prefers to think of as a king. In avoiding defeat, Liverpool's unbeaten run at home in the league now stretches into a third year. Their last home victory over Chelsea in April was in 1990 and a few weeks later they were crowned champions. It will take a slip from Manchester City for that to happen again. But Liverpool, with Salah in this mood, are not a team whose momentum is slowing. 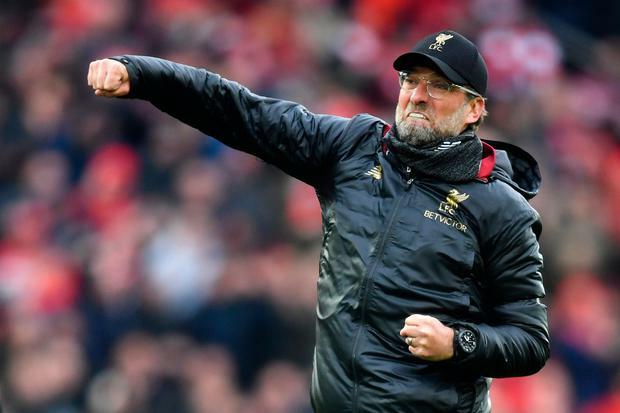 Instead, it feels like their belief is growing stronger - that is certainly the case with Klopp, who was "blown away" by Salah's strike. "I was really happy and I saw it because I was in line with the ball," said the Liverpool manager. "Maybe I saw it first that it would go in. It was a really, really outstanding finish and I don't want to minimise that. "But I loved the first goal, too (by Sadio Mane) and I was immediately reminded of the 4-3 against Borussia Dortmund. "Hendo (Jordan Henderson) instead of Milly (James Milner) and Sadio (Mane) instead of Dejan (Lovren), but good team play, good cross, good header. "The performance was really good, but you need the goals, and we got them." After a relatively quiet spell in front of goal, Salah has struck two in crucial and spectacular ways for his side in successive games. "I said before when you ask me about when I have concerns. The answer for football is always work rate, and the work rate of all three up front today, again, was outstanding," Klopp said. "Chelsea is a top, top, top team. We treat these games like Champions League games, nothing else. And you cannot defend a team like this without offensive wingers. "How the boys worked was unbelievable. And they got the reward for that. You can get an easy goal from a yard or a shot from 25 yards, a thunderbolt. Outstanding. "We controlled and dominated the game for 80 minutes which is the best you can say about a game against Chelsea," added Klopp. "But in these 10 minutes they could have changed the game completely. A post and two saves from Alisson, right? "But then we controlled the game again. It was a fantastic performance." Klopp suggested that a few second-half tweaks helped his side. "We just wanted to be a bit more flexible. First half we were left-dominated. We had our moments on the right as well, but that was one of the things we spoke about at half-time and it was wonderful that we got a goal from there, with Hendo chipping the ball in."